This winter warmer salad is vibrant and fun. Lentils provide a rich source of essential nutrients such a B group vitamins, protein and iron. An ideal alternative for vegetarians and very filling. Stock of your choice (I used beef because it has loads of flavour). Make your own or make sure you use a good quality preferably organic low salt brand. Cook the lentils according to packet instructions and set aside to drain. Top and tail the beans, cut the broccoli into florets, wash the peas and steam the lot - separately! 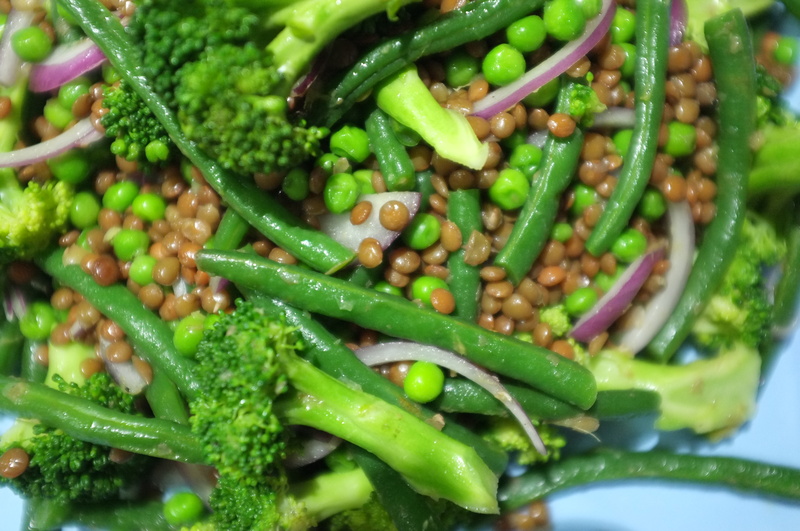 Toss the lentils and veggies in a large bowl, then add finely sliced onion and torn mint leaves. Mix through a dash of your chosen dressing and if you're serving the tahini dressing, serve extra on the side. Mix all the ingredients in a jar or small bowl, add roughly chopped mint and serve. Mix 3 parts olive oil to 1 part lemon juice or vinegar into a jar, then add remaining ingredients and shake.